One touch operation for ease of usage. Helps in reducing freeze burns and spoilage of foods. Fitted with hands-free and seal indicator lights. Fitted with patented removable drip tray. 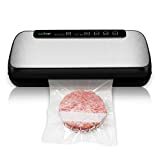 The Seal-a-Meal FSSMSL0160-000 Vacuum Sealer is a countertop vacuum sealer which can be used for vacuum sealing food products by effectively removing air from the storage bag and reliably sealing it with heat. Vacuum sealing reduces waste and extends the shelf life of foods. The Seal-a-Meal Vacuum Sealer is a fully automatic machine with one-touch operation which makes it very user friendly. By opting for sealing your food products with this machine, you not only avoid food wastage but also create extra space in your freezer; fridge or pantry as vacuum sealed packs use less space as compared to traditional storage methods. The Seal-a-Meal Vacuum Sealer sells for around $46 and contains 4-quart starter bags absolutely free. 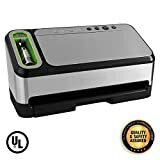 You can also use this vacuum sealer to store fresh vegetables and fruits in bulk that you pick up from the farmer’s market. Just portion them for your day-to-day use and vacuum seal them. You can also use this sealer for storing special cuts of meat, poultry and fillets of fish. If you are an avid hunter or fisher, consider vacuum sealing your meats for storage or to give them away to friends, family and neighbors. And if you’re an avid outdoorsman, vacuum seal your supplies and you will be amazed at how little room it takes up in your backpack. The Seal-a-Meal Vacuum Sealer is designed as a counter top machine with fully automatic one touch operation which makes it very user friendly. This vacuum sealing device comes fitted with sealing indicator light, hands-free indicator light, sealing strip, removable drip tray, lower sealing gasket and upper sealing gasket. The one touch open/cancel button is located at the top of the machine. The sealer is designed to accommodate 8-inch, 11-inch, quart-size, and gallon-size heat-seal bags. The patented drip tray catches accidental overflow of liquids while sealing bags to avoid messes, thus keeping the operational area clean. Select an appropriately sized bag, add food or any other product you may require to seal into the bag and place the open end of the bag on the drip tray. Lower the upper lid and press both sides of the lid to start hands-free sealing of the bag. Continue to hold the lid until the hands free indicator is “on,” then remove your hands. Sealing is complete when the motor stops and the sealing indicator light is no longer illuminated. Press the open/cancel button to raise the lid and remove the sealed package. While using bag rolls, pull enough length of the bag that is required to store the item to be packed, but add three extra inches around the margin. Cut the bag using a pair of scissors—make sure that you cut the bag in a straight line. After cutting the appropriate length of the bag, just follow the instruction given above to seal it. The Seal-a-Meal FSSMSL0160-000 Vacuum Sealer requires only basic maintenance. Always remember to unplug the machine before cleaning it. You can clean the vacuum sealer by using a damp sponge to wipe it clean because of its smooth surfaces. You should never immerse this machine in water. Always check gaskets and the round drip tray to clear them of any sort of food particles or liquid discharges. You can wipe the gasket using a damp cloth. The removable drip can be washed in the dishwasher. Make sure to dry the machine thoroughly before using it. The Seal-a-Meal Vacuum Sealer is easy to use and the instruction manual is easy to understand. This Best Vacuum Sealer is perfect for vacuum storing food products, important documents and treasured items.